Notes: The castle is found on an Unnamed Road off the B846 (sign-posted to Kenmore). Cross over the bridge spanning the River Lyon and the Tower House can be seen to your left in a garden. Short term on-road parking is possible. The remains of a sixteenth century Tower House but the structure is located in a private garden with no public access. The ruins can be viewed at a distance from the public road. Situated on the banks of the River Lyon, Comrie Castle was the original seat of Clan Menzies. The ruins seen today date from the sixteenth century when an ‘L’ plan Tower House was built to replace an earlier structure that had been devastated by a fire in 1487. Comrie Castle was built by the Menzies family who settled in Perthshire no later than the mid-twelfth century. The Menzies are believed to have originally come from Mesnieres near Rouen in Normandy. They came to Scotland during the reign of David I (1124-53) who actively encouraged such immigration in order to exploit their military skills. Originally granted land in Lothian, Sir Robert de Meyneris rose to become Chamberlain to Alexander II and was granted lands in Atholl. His son, Sir Alexander Menzies, was subsequently granted the lands of Aberfeldy and Weem. The family further extended their estates in the surrounding area by supporting Robert the Bruce during the first War of Scottish Independence. 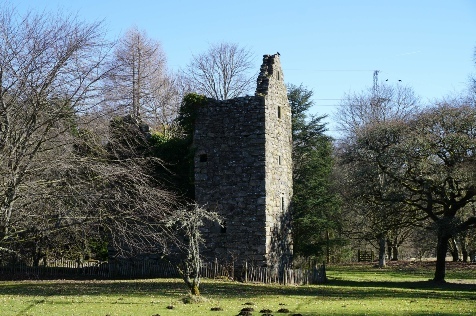 They built numerous castles to secure their estates including Castle Mains (Ardeonaig), Comrie, Garth, Grandtully and Loch Tay. Around 1557, the castle was rebuilt in the form of an L plan Tower House and is one of the earliest examples of this configuration. The main rectangular block took the standard form with a vaulted basement at ground level, a hall on the first floor and accommodation above. The adjoined stair tower provided access to all levels. Gun-loops were built into the structure to provide defences predominantly against the raiders associated with the general lawlessness of the period. The castle would have been surrounded by the ancillary buildings associated with such a settlement including Bakehouse, Brewhouse, Kitchen and Stables. It remained in occupation until the eighteenth century and thereafter was allowed to drift into ruin.